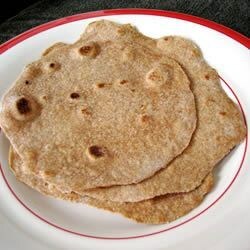 "A an unleavened griddle bread from India which is similar to pita bread. It is also known as roti. Ideally, I use the traditional Indian roti griddle called a 'tava.'" In a medium bowl, stir together the flour, salt, water and oil, until the mixture pulls away from the sides. Turn the dough out onto a well floured surface. Knead until smooth and pliable, about 10 minutes. Preheat an unoiled skillet or tava to medium high heat. Divide dough into 12 equal parts, form into rounds and cover with a damp cloth. Flatten the balls with the palm of your hand, then use a rolling pin to roll out each piece into a 6 to 8 inch diameter round. Cook the roti for 1 minute before turning over, then turn again after another minute. The roti should have some darker brown spots when finished. Best served warm. Very good. A note to NIVES123 - Roti is eaten with the meal (used to scoop up your dal, curry, etc. ), it's not supposed to be sweet. Bravo! I used all whole wheat flour. Quick and delicious!